Counterfeit goods today are found throughout the world; wherever a demand for a product exists, counterfeiters quickly fill the niche. Counterfeiters compete undetected with brand owners, undermine brand profitability, fund the underground economy, and undermine brand reputation. A brand’s long-term success depends on protecting its integrity. Brand owners who do not believe they have a counterfeiting problem likely have not looked. ANY branded product can be counterfeited. Brand protection programs can offer a proactive means for ensuring brand integrity. Such efforts involve not just enforcing intellectual property rights when a counterfeit has been discovered, but implementing anti-counterfeiting efforts in every link of the supply chain: design, assembly, packaging, third-party suppliers, transportation, distribution, and return. Brand protection problems cannot be addressed by brand owners, governments, or consumers on their own. Partnerships can provide crucial leverage and facilitate the use of multiple effective anti-counterfeiting approaches. Collaborations among brands, industry associations, law enforcement, consumer organizations, and academia can be invaluable in the fight against product counterfeits. Sharing resources and information is critical to taking full advantage of partnerships, and particularly for developing evidence-based anti-counterfeiting and brand protection solutions. 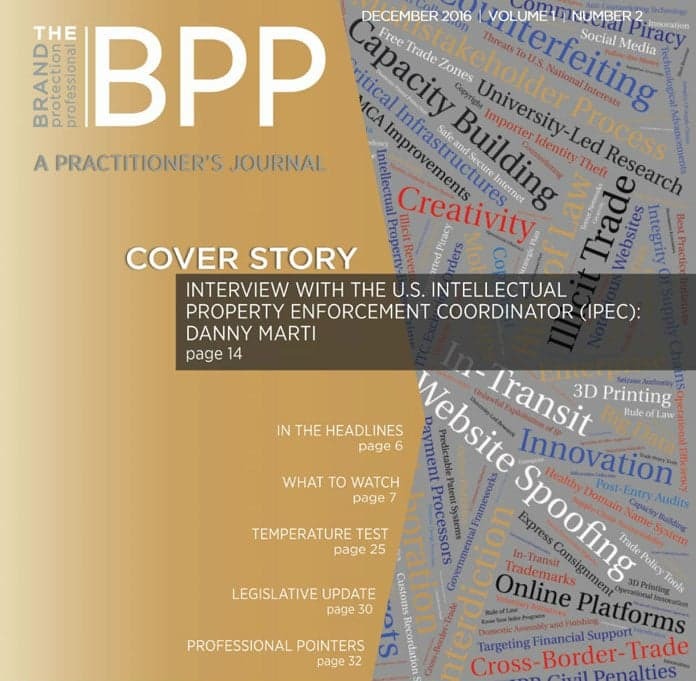 The Brand Protection Professional (BPP) – This recently launched journal offers brand owners a place to share information, develop ideas, and contribute to an ongoing conversation on issues, research, and information related to brand protection and anti-counterfeiting solutions. The BPP is a partnership between the MSU Center for Anti-Counterfeiting and Protect Protection (A-CAPP) and Underwriter’s Laboratories (UL). Brand Protection Strategy Summit - Held annually at MSU, this summit features research from world-renowned scholars, field-driven insight from leaders of industry and law enforcement, and discussions of emerging challenges and strategies. The Summit is a partnership between the UL and the MSU A-CAPP Center. International IP Crime Conference – This well-known and highly attended annual conference provides brand owners from numerous industries with opportunities to interact directly with law enforcement officials from around the world. The conference is a partnership between UL and INTERPOL. Click here for our Backgrounder on the importance of partnerships in brand protection, supported by UL Global Security & Brand Protection. Additional information and resources are available at the MSU A-CAPP Center and UL websites. Brandon A. Sullivan is an Assistant Professor at the MSU A-CAPP Center. He serves as Principal Investigator of the Product Counterfeiting Database (PCD) and is a Research Affiliate of the Research Foundation of the City University of New York, the National Consortium for the Study of Terrorism and Responses to Terrorism, the National White-Collar Crime Research Consortium, and the MSU College of Law. His research focuses primarily on emerging areas of crime and justice, particularly those involving transnational criminal enterprises and networks, including fraud, product counterfeiting, extremist financial crime, and environmental/conservation crime.